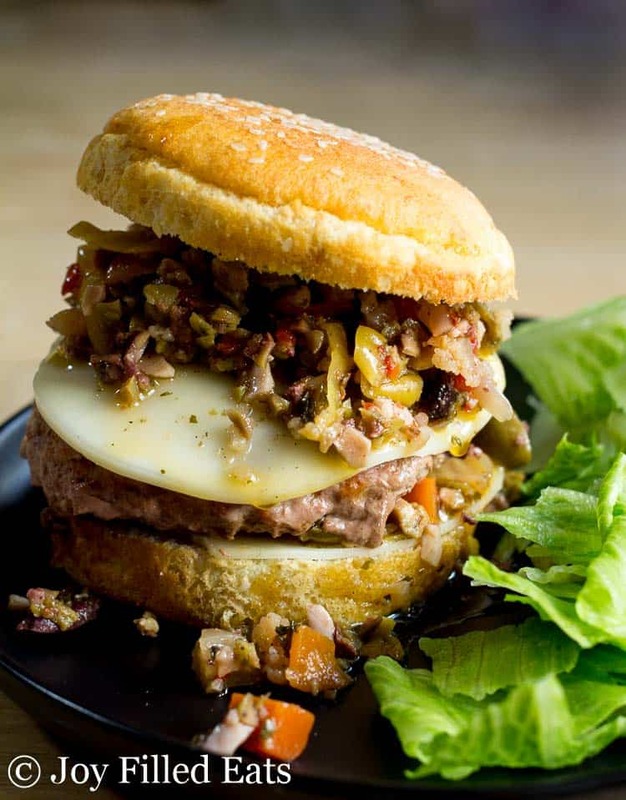 The delicious Cajun Burgers have layers of olive salad and provolone cheese sandwiching a healthy Cajun-spiced turkey burger and stacked on a low carb bun to remind you of a classic muffuletta sandwich. I first heard of a muffuletta sandwich when I was in high school. I was over my best friend’s house and her dad was making one. I was intrigued by the layers of meat, cheese, and olive salad but not intrigued enough to take a bite. That was in the middle of my vegetarian years. The next time I met a muffuletta was when my husband and I went to New Orleans on our 1st wedding anniversary. I just had to try one. I fell in love with the myriad of flavors in the muffuletta olive salad used on the sandwiches. Fast forward almost 14 years and I’m walking through Costco and see big jars of, you guessed it, muffuletta style olive salad. 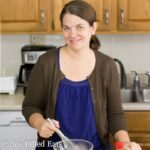 The ingredients were totally fine for a low carb or Trim Healthy Mama eating plan so I decided to give it a try. It is delicious! The version sold at Costco has a lot of olive flavor with a little bit of a kick from pepperoncini peppers. If you’d like to make your own New Orleans style olive salad it isn’t hard (and here is a recipe to try) but it is easier to just pick up a jar. 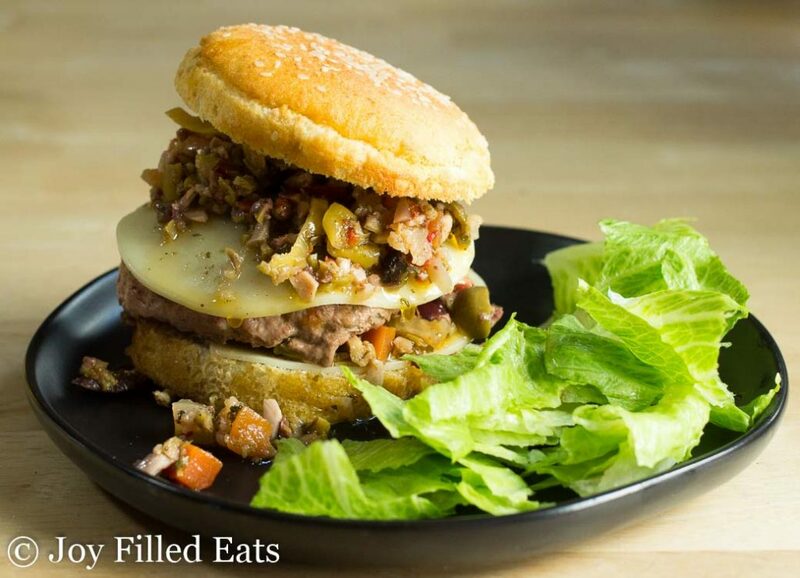 I used SmartBuns for my burgers but if you’d prefer to make your own buns you can try this Low Carb Sandwich Roll Recipe from my friend Sarah over at My Montana Kitchen. 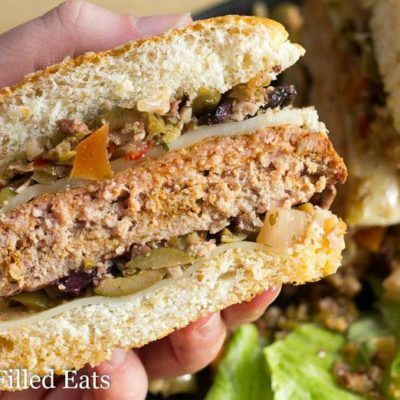 “A traditional-style muffuletta sandwich consists of a muffuletta loaf split horizontally and covered with layers of marinated olive salad, salami, ham, Swiss cheese, provolone, and mortadella. Quarter, half, and full-sized muffulettas are sold. And there you have it, compliments of Wikipedia. I changed it up quite a bit to turn that sandwich into a burger but this was just as good as the original. What is in cajun seasoning? Penzey’s Cajun Seasoning has paprika, salt, celery, sugar, garlic, black pepper, onion, oregano, red pepper, caraway, dill, turmeric, cumin, bay leaf, mace, cardamom, basil, marjoram, rosemary, and thyme. And, yes, I used it even though the 4th ingredient is sugar. I would prefer if it didn’t but since you use such a small amount it only adds maybe a gram to each burger. In the future, I’m going to try McCormick Cajun Seasoning or make my own Cajun seasoning instead. 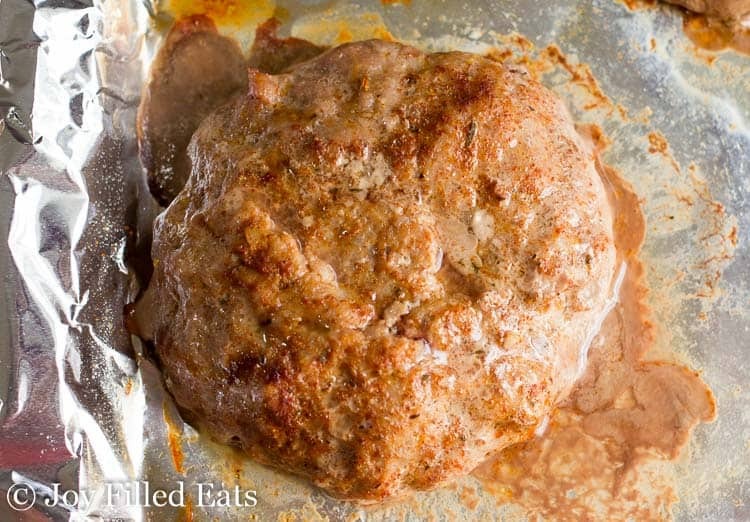 How do you cook turkey burgers in the oven? This is the only way I cook my turkey burgers. It ensures they are done at the same time. I can’t fit enough in one frying pan to feed my whole family. I simply shape the burgers, season them, put them on a foil-lined baking sheet, and bake at 400 for 20-30 minutes until they reach 160 when checked with a meat thermometer. 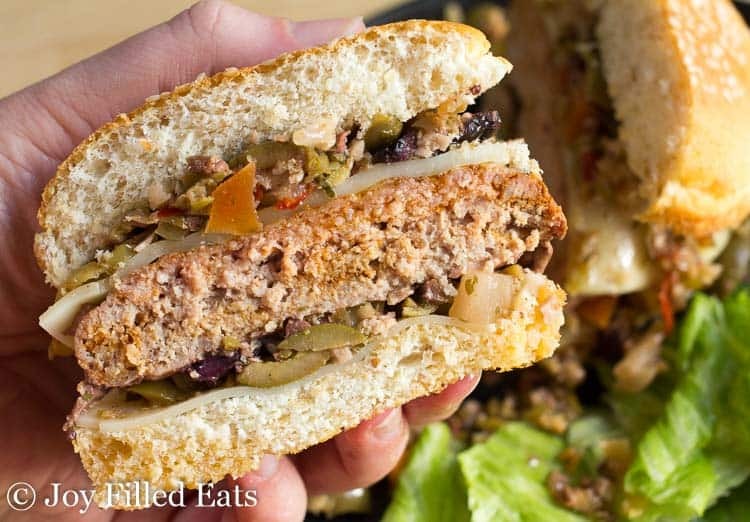 ​​​​​​​The delicious Cajun Burgers have layers of olive salad and provolone cheese sandwiching a healthy Cajun-spiced turkey burger and stacked on a low carb bun to remind you of a classic muffuletta sandwich. 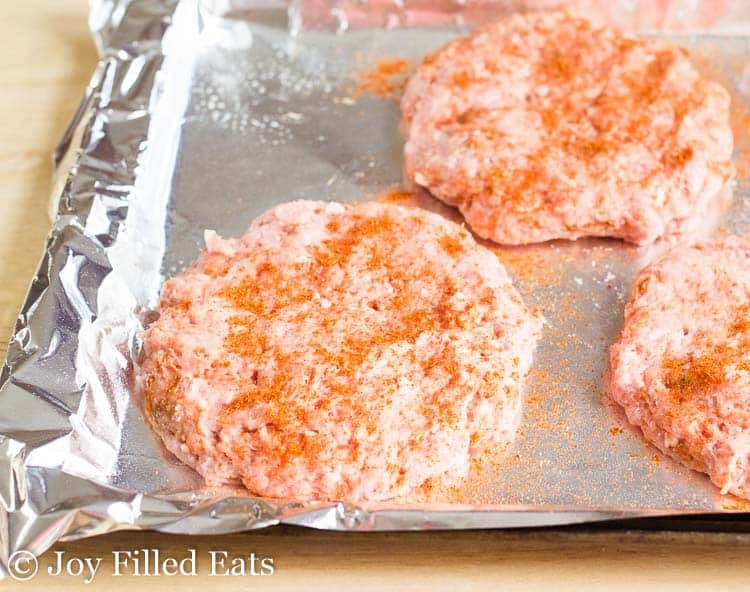 Mix 2 tsp of the Cajun seasoning into the ground turkey and shape into 4 burgers. Sprinkle the remaining 1 tsp Cajun seasoning over the burgers. Bake for 20-30 minutes until they reach 160 degrees when checked with a meat thermometer. Put 1 slice of provolone cheese on the bottom bun. Top with 1 tbsp olive salad. Top with a cooked turkey burger. Add another slice of cheese and 1 more tbsp olive salad. Put the top of the hamburger bun on. Enjoy! If you do not have a Costco membership here are some other options to buy olive salad. I made the burgers and ate them with a salad on the side. They are absolutely fantastic!!! Thanks for the recipe.